Clear water, clean lines, lots to see and lots to learn. There is something so smart and cool about the whole exposed roots look, that is totally on trend with the ‘How it’s made’ fascination of many people, especially millennials and centennials. Roots are vital for plants. They absorb the water and nutrients that the plant needs to grow. They also anchor or help the plant to stay in one place. And let’s face it, they look weird and wonderful in water. 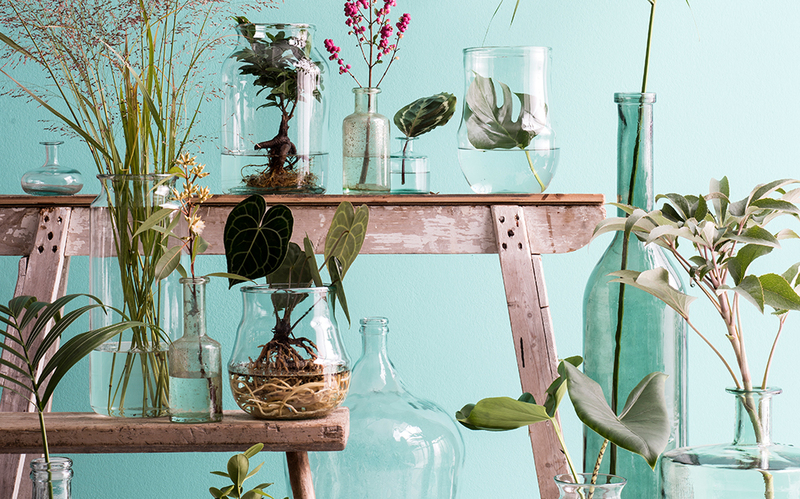 Elementary for the Show Your Roots Look is a vase or bottle, carafe or jar of clear glass. Mica Decorations offers ample choice. For a minimalistic presentation there’s square Lotty. Are you going for the very Instagrammable lab look, ball glass Tokio is perfect. Bowl Boly is great for small plants. And in bottle vase Gina plants with long roots can hang about as much as they like. Simply pick the right plant, shake of the soil, rinse the roots thoroughly and let them do their thing. Not all plants are suitable to display in water. Green beauties that love a foot bath are Baby’s tears (Soleirolia), Isolepis (the one that looks like a fiber-optic plant), Kraus’ spikemoss (Selaginella) and Umbrella palm (Cyperus). Is the opening of the vase too wide to hold the plant? Criss-crossing sticky tape on the opening will offer the support you need. Now, if a Miniature Mangrove is not your thing, you can also go Desert. In this case pick air plants that absorb moisture and food from the air (Tillandsia), orchids with air roots or succulents. Simply rinse of all soil and put them on display with no water. Once a week take ‘m out, mist the roots and leaves (or let them soak for 30 minutes) and put them back in the vase. 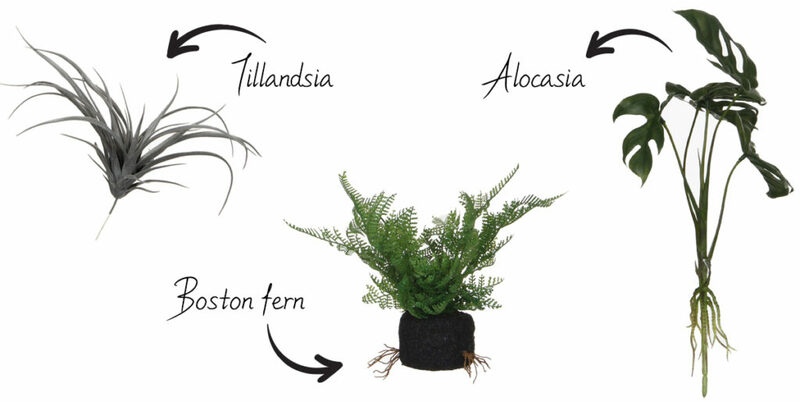 Good to know: Mica Decorations offers true-to-nature air plants and no maintenance botanicals for a fuss-free gorgeous faux green element in your home décor! Want more plants? 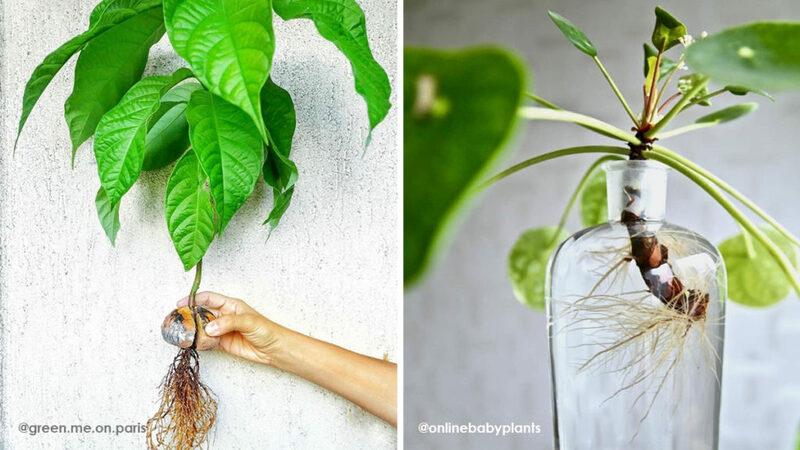 Rooting cuttings in water is a fun, timeless way of increasing your plant collection for little to no cost. These days it’s also done for aesthetic reasons. There is something quite magic about seeing the roots grow and it’s the easiest living green thing you’ll ever own: as long as it has water, it’s good. Pick a plant, take an angled cut below a leaf node of the parent plant with a sharp, clean knife or a pair of scissors. Fairly new growth offers the best results, you need a cutting that is minimally 5 cm. Remove the leaves that will end up under water. Pick a small container. The cutting will release hormones into the water to encourage rooting, and a great volume of water will dilute them, so that the process takes longer. Place the cuttings in the container. The leafless portion of the stem should be submerged and the remaining leaves should be out of the water and hanging over or resting on the lip of the jar. Place the jar in spot with ample light (no direct sunlight) in room temperature and make sure there’s enough water in it. Than simply wait and see things grow. In general green plants with soft pliable stems root better in water than woody cuttings, but it’s not impossible to let a branch shoot roots. Herbs like mint, oregano, basil, rosemary, lavender and sage grow fairly easily in water. House plants like spider plans, ivy, philodendron, tradescantia, pilea, purple passion and coleus do well. Flowering plants like Begonia and Pelargonium also easily root in water. What’s next for your plant? If you just want a minimalistic water based plant, than this is it. Refresh the water now and then, add a little food or rainwater to make sure there’s nutrients in there. Should you want to pot your cuttings, don’t let it grow in the water too long, because that will make the roots brittle. When it has developed a basic root system, transfer your brand new plant to loose soil in a lovely Mica Decorations pot, put pot and plant in a light spot (no full sun) and let nature do its thing. Congrats, you’re a true grower now!